Last week I caught up with seasoned entrepreneur Jeffrey Kimathi who shared the inspiration for his journey to start his latest business the BUYU Collection, the challenges of doing business in Africa and his pearls of wisdom for those seeking to start a business on the Continent. BUYU is the latest brand to shake-up the African luxury market, seeking to create luxury travel accessories using sustainably harvested baobab bark fibre and American leather. 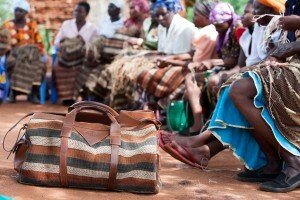 All accessories are hand spun using an age-old technique passed down through generations of women in Kyuso, Kenya. Born in Nairobi, Jeffrey Kimathi started his career in New York in the fashion house of Mark Echo. He started as an intern who wasn’t even enrolled in school, but left such an impression with the label that he was offered a marketing role with the brand. After extensive experience, he ventured out to create Jamhuri Wear in 2000 – a brand that quickly took the industry by storm. Soon after the launch of his label, Kimathi was able to connect with Senegalese singer Akon in 2003, who wore Jamhuri Wear in his “Ghetto” video. The fashion entrepreneur’s biggest break happened in 2005, a mere five years since starting the brand, when Jay-Z wore a Mandela shirt from Jamhuri wear at the Philadelphia Live 8 concert. In fact, Kimathi’s fashions still catch the attention of celebrities worldwide and Lupita Nyong’o was recently seen with an accessory from the BUYU Collection. After the brand’s biggest break in 2005, Kimathi soon began to feel some conflicts both within himself and for the brand. When he initially started pitching to retail boutiques they would often say, “Who’s going to buy this? Africans don’t even wear clothes” – a wholly false, but sadly commonplace misconception. Once Kimathi worked on the retail side of his business more and his brand was sold out online at Dr. Jay’s the frequent challenge became “are you authentic?” Soon the boutiques questions hinged around when he last went to Africa. In pitches, Kimathi would talk about the huge African market and was often met with the question “How do you know, when were you there?” This culminated in Jamhuri wear losing a deal with H&M because they felt he was “an African American now”. Kimathi didn’t fit into their notions of the African designer story. At this point, Kimathi felt that he needed further inspiration before continuing with Jamhuri wear. The whole idea of the brand was about Kenya – Jamhuri is Swahili for Republic and mark’s the date of Kenya’s independence – and Kimathi felt that he needed to rediscover it. So the fashion entrepreneur travelled backed to Kenya. He intended his trip to be three weeks but in the end he stayed for three years! When he returned to Kenya he soon discovered that “Africa marches to its own beat” – the Kenya he left as a child, and which he had based his successful brand on, did not exist. He had to reconnect and learn about the modern Kenya. Jeffrey Kimathi is a self-described disciple of Dieter Rams and Bauhaus whose principles of honest and simple design form the backbone of BUYU. Walking through an open air market Kimathi saw an amazing basket perched among an array of beautifully woven pieces. “I just thought why don’t we make this into luggage… I could help my people create a profitable business”. These baskets were made using the bark fibre of the baobab tree and the discovery of this fibre inspired numerous months of exploration by Kimathi – the more he learnt about the product, the more impressed he was. Indeed, Kimathi was taken with finding “a way to live holistically with nature and not destroying the ecosystem”. A little known fact is that the baobab tree has also been immortalised in film – The Lion King’s Rafiki lived in one! Kimathi soon met his business partner Diana Owusu-Kyereko and they both saw the opportunity in the woven pieces particularly in terms of generating economies of scale and exporting the accessories worldwide. BUYU also has a firm social purpose to empower its team of female weavers and to create jobs. By the turn of the next century it is estimated that 40% of the world will be African. On top of this, Africa is one of the youngest continents with a median age of 17 and 30 million youngsters enter the job market each year. Jobs are sorely needed and Kimathi wants to use the brand to create indigenous economic opportunities in Kenya. He and Diana firmly believe that “if you nurture a woman you nurture a nation”. To this end, BUYU buys all bags made by its weavers at a fair trade price and Kimathi and Diana also make a concerted effort to be part of the Kyuso community, listening to and understanding their needs. The team also give training to their 30 weavers for them to make the right decisions, make them a better cooperative and to make their money accountable. Perhaps the most beautiful aspect of BUYU’s accessories is their individual personalities. 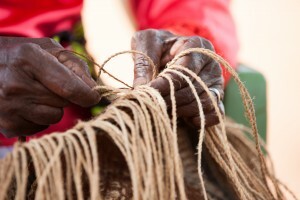 No two bags are exactly alike since each weaver has their own signature style. Kimathi likens the unique character of each bag to “selling a piece of art” and a way to “celebrate” the fact that no two journeys in life are the same. Regardless of industry, a typical challenge is the difficulty of trying to modernise ancient practices. When developing the prototype, Kimathi and Diana struggled to emphasise to the Kyuso women that their skills could be used to create travel accessories, not solely baskets. In addition, bags could be created faster with the use of flat panels rather than the laborious process of weaving the entire product by hand. Another key challenge for the fledgling business was finding the right manufacturer who could work with the baobab fibre. The bark of the baobab tree has many features, including its sheer strength. Unsurprisingly, the creation of the prototype resulted in the breaking of numerous needles. As a result, the co-founders spent many hours with different manufacturers before finding one who was able to work with this robust material whilst meeting the brand’s very high standards of quality. “If you want to do business in Africa, leave culture and what you think works in Africa at the border”. Kimathi emphasised that people who are new to the Continent often impose their ideologies of what they think would work. Rather, he suggests entrepreneurs should assimilate to the ways of the relevant country, ask questions and be open to an African solution. Sadly, with the increasing trend of Kenyan youth moving to cities instead of staying in the villages, the art of weaving baobab bark is waning. 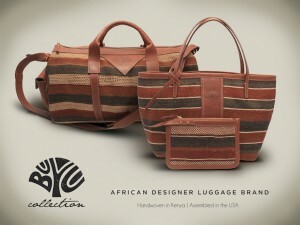 BUYU is not just about travel accessories but sees its mission as keeping a tradition alive. This new brand intends to preserve this weaving craft and create its products in a sustainable manner. The owners are in the process of establishing the Baobab Conservatory Foundation and 10% of the profits from BUYU will be given to the Foundation to improve the communities it partners with. Kimathi and Diana have big dreams for this exciting new brand. Eventually Kimathi wants to explore the various ways in which the baobab bark fibre is woven throughout the Continent, with the aim of reflecting these methods in future seasons of BUYU. BUYU means the seed of the baobab tree in Swahili. Kimathi and Diana want their brand to be the seed that will create a new concept of luxury, one that enriches the person who owns the accessory as well as enriching our world. They want their new collection to be experienced as a form of art that will provide sustainable benefits for the women who manufacture it. BUYU is investing to develop supply chain and streamlined manufacturing processes to realise their vision in the long term. As an alternative to raising early stage investment, Diana & Kimathi launched a crowd-fund campaign to invite BUYU’s future customers to share in the growth, development and evolution of the brand and its products. If you would like hear more about BUYU or pre-order an accessory (shipped worldwide) you can visit their website. Previous Post	Jambo Nairobi, Kenya!